To post Snowy White playing Peter Green´s Slabo Day is a reference to the Greek band Universal Hippies. If you like dynamic guitar playing, along mesmerizing melodies and riffing, that gives each and every instrument enough room to spread in your headphone or audio system, you cannot ignore this band. This record is an entire piece of great musicianship, spiced with a clear and reduced, almost a Rick Rubin like, production. Enjoy the different colours of different guitars, enjoy the harmonic ups and downs in major and minor scales, imagine yourself landscapes and campfires and start your everlasting trip with this fantastic 10/10 record. 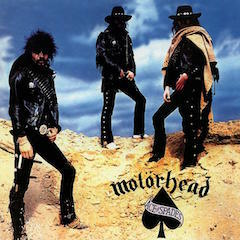 This record has as the Ace of Spades a consequent musical direction, is full-packed with killersongs and well produced. This page was designed by Martin Ripsam with support by Jimdo. All the articles were written by Martin Ripsam.